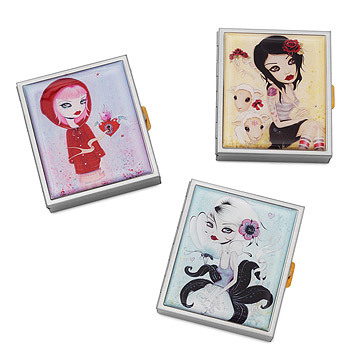 Get your daily dose of storybook charm with Caia Koopman's whimsical, brushed steel vitamin cases. You'll be that much closer to a fabled ending with discreet personal tins that keep unkempt pills from ruining the moment. Choose from one of three illustrated damsels by Caia Koopman: Little Bo Peep, Little Red Riding Hood or Thumbelina. Made in Los Angeles. Sold individually. If the item appears scratched, please remove the protective plastic film on the back of the case. Little Red Riding Hood has been discontinued. When it sells out, it will no longer be available. We apologize for any inconvenience. I really like the artwork on the lid of case. I liked that it had different sized little compartments for your pills. This was a gift for my sister, as she was using a plastic box from tylenol that you would buy at a gas station! She loved it and threw that old nasty box away!! Such beautiful artistry. I bought Thumbelina and am thinking of buying more for others. This pill case is securely closes & is so unique. I will be back for more for gift giving! I love this pill carrier! It is stylish and my pills stay separated in the compartments inside. I could probably have a couple days worth of medication inside, but it really depends on how much medication you take each day. I bought this because I was sick of those monday - sunday containers that opened up in my pocket book and spilled vitamins and advil all over the place. I have been looking for a long time for a container that would hold enough to keep a couple days worth of vitamins and advil but a lot of them were big enough for only a one day supply or would never lock. This was a splurge for a pill container but it is awesome! Love the look and the size and the organization. I am so happy I bought this and my sister loves mine so much I am thinking of getting her one for her birthday. It is so cute and I get a lot of compliments on it! Bought one for myself.....made my daughter and daughter-in-law jealous, and so I bought one for each of them---will be a great Valentines Day gift! Very satisfied with this purchase. The Art work on the pill box makes it a great display piece in itself. I bought one for myself AND my friend!!! Its great to have something fun to carry my vitamins in for when I'm out and about. No one likes to pull out a prescription bottle when they are out to dinner, these are just cute and sensible!!! lots of room with separate compartments! Very cute as well as sturdy! U will love!!! Live happily ever after with whimsical, brushed steel vitamin cases featuring Little Bo Peep, Little Red Riding Hood or Thumbelina.